Welcome to Black London Histories. This website will record my process as I build a digital map of black London life, culture and politics, covering the period from the 1958 white riots in Notting Hill to the 1981 Black People’s Day of Action. The map is part of a project that I am beginning as a Leverhulme Early Career Fellow at the University of Birmingham’s Department of History. My project aims to map out the material and mental spaces of ‘black London’ created between 1958 and 1981. I hope to explore what ‘black London’ meant and how it was experienced by those people who in various ways produced and lived through it, and to see how it was connected to the multiple planned or organic projects for the creation of an anti-racist, multicultural or cosmopolitan city. Ultimately, as I explain at the end of this post, I am interested in the relationship between the production and living of ‘black London’ and the development of politics of race, anti-racism, multiculturalism and cosmopolitanism. I also, though, hope to offer a resource for others interested in the historical development of black London. Part of my project here, as I indicated above, is the development of a digital map of black London between 1958 and 1981. 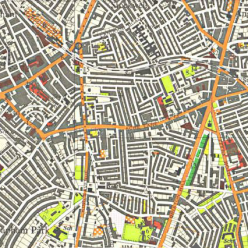 This website will be primarily dedicated to posts on the development of the map, exploring what black London life looked like in these decades, and what it meant. The map aims to provide a topography of black London which extends from its social and leisure sites, community and educational centres, political headquarters, and commercial enterprises, to key sites of protest, celebration, confrontation and conviviality, which marked out particular locations as symbolic nodes in the life of the black metropolis.